Kolkata Knight Riders won the match by 4 wickets against the Royal Challengers Bangalore at Eden Gardens, Kolkata. Sunil Narine was awarded as the Man of the Match for his all-round performance that had actually made Kolkata win their first game of IPL 2018. Team Circle of Cricket gets down to list the 5 talking points of the match. Click on the links to get onto the next page. Virat Kohli and Ab De Villiers were involved in a determining 64 run partnership for their team which actually set the pace of their innings. 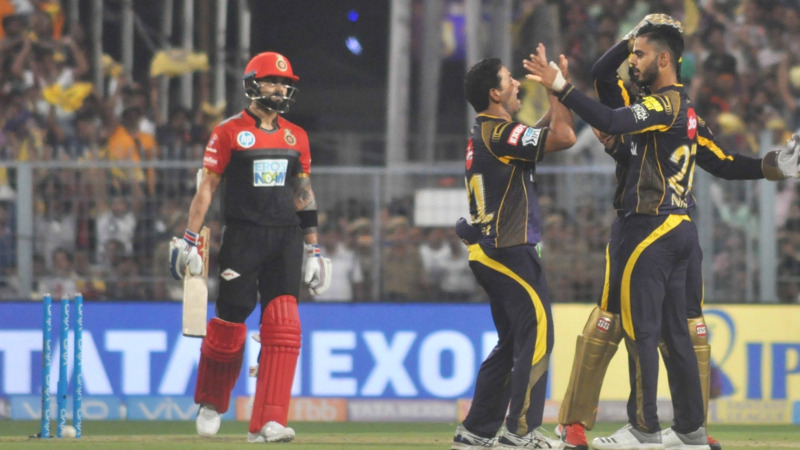 Virat Kolhi was rotating the strike and whereas Ab De Villiers was putting them out of the part but that did not last forever, however, a bowling change for Kolkata Knight Riders worked in their favour to get rid of the deadliest players in the tournament. Nitish Rana put an end to both of their innings in a very quick succession. Nitish Rana's over was actually the turning point in KKR's victory over RCB. Nitish bowled an over of the tournament after taking Ab De Villiers and Virat Kohli's wicket consecutively. It was the 14th over of the first innings where Dinesh Karthik asked Nitish to ball and he conceded 11 runs and break the pillars of RCB batting line up. He must be delighted after getting those two wickets for his team. After Kohli and Ab De Villiers wicket, it was looking difficult for Royal Challengers Bangalore batsmen to play the ball but Mandeep Singh showed courage and took his team to a comparative total of 176 runs. Mandeep scored vital 37 runs with a strike rate of 200+. It was his innings that had made RCB fight till the end. Mandeep Singh is a great middle order batsman who can even finish games for his side. After Sunil Narine's assault things looked to change for Royal Challengers Bangalore a bit in the middle overs when some DRS went RCB's way. Nitish and Rinku's wicket were the areas where RCB would have loved to put pressure on their opponent. But the fortune and luck were with Kolkata Knight Riders tonight, they had everything in the right place. Kolkata Knight Riders had comfortably beaten Royal Challengers Bangalore by 4 wickets on their home ground Eden Gardens. Dinesh Karthik and Andre Russel had a very vital role in the win as one was stimulating the strike and the other was hitting them for huge sixes all over the park. Kolkata has got a very good start to their tournament and whereas Royal Challengers Bangalore will look out to work on their basics and have some changes to the squad. This was Kolkata's twelfth win against Royal Challengers Bangalore in the Indian Premier League, they will surely like to keep continuing their momentum going on the right path keeping in mind they face Chennai Super Kings in their next encounter.